"Come try, it tastes like biltong" said the grinning waiter at The Boma restaurant in Victoria Falls, Zimbabwe. It was the right enticement: I happen to love biltong. But chewing on a grub? As fortune would have it, I had been wanting to taste a mopane worm for some time, and it looked like the time had come. Despite their name, mopane worms are not worms at all, but the caterpillar of a species of emperor moth known as Gonimbrasia belina. It's a delicacy in some parts of Southern Africa and considered a bush food in others. But everyone agrees that the worms are highly nutritious, and some even regard them as truly delicious. The Boma is a classic tourist venue set in the lovely grounds of the Victoria Falls Safari Lodge. Dinner at this proudly Zimbabwean restaurant is a legendary affair, with countless local dishes served in buffet style. These include delicacies like impala terrine and warthog fillet. A witchdoctor is available to tell your fortune by throwing his bones; dancers entertain with traditional Shona and Ndebele routines; and then... there's the vat of mopane worms. What do Mopane Worms Taste Like? The worms at The Boma are fried with tomatoes, onions and garlic, none of which really disguise the off-putting prospect of the caterpillar's black head and grubby, grey body. With the waiter looking on encouragingly, I popped one in my mouth and began to chew. The initial taste of the mopane worm wasn't so bad, hidden by the garlic and onions. But as I continued to chew, the real flavor became unmasked and I detected a blend of earth, salt and drywall. It wasn't very good. I did manage to swallow it finally and because this was a touristy affair, I even got a certificate to prove it. I value this certificate above the one I got for bungee jumping off the Victoria Falls bridge. Most people who enjoy mopane worms obviously do not get certificates for eating a solitary grub. Normally, you'll see huge bags of dried and/or smoked mopane worms in local markets throughout rural Zambia, Zimbabwe, Botswana, South Africa and Namibia. They're greyish-looking when dried (after their green guts have been squeezed out) and at first glance you might think that you're looking at some kind of bean. Mopane worms get their English name from their preference for mopane trees, a relatively common species found in the northern areas of Southern Africa. The best time to harvest them is late in their larval stage, when they're plump and juicy and haven't yet burrowed underground to pupate into their moth phase. Mopane worms also feed off mango trees and other bushes. Fresh mopane worms are a seasonal delicacy, but some local supermarkets also sell brine-soaked worms in cans. Mopane worms are called phane in Botswana, mashonja in Zimbabwe and parts of South Africa, and omangungu in Namibia. Despite their dubious taste, they pack a serious nutritional punch, consisting of 60% protein and high levels of iron and calcium. Since mopane worm harvesting requires little input in the way of resources, the caterpillars have become a profitable source of income. In Southern Africa, mopane worms are a multi-million Rand industry. 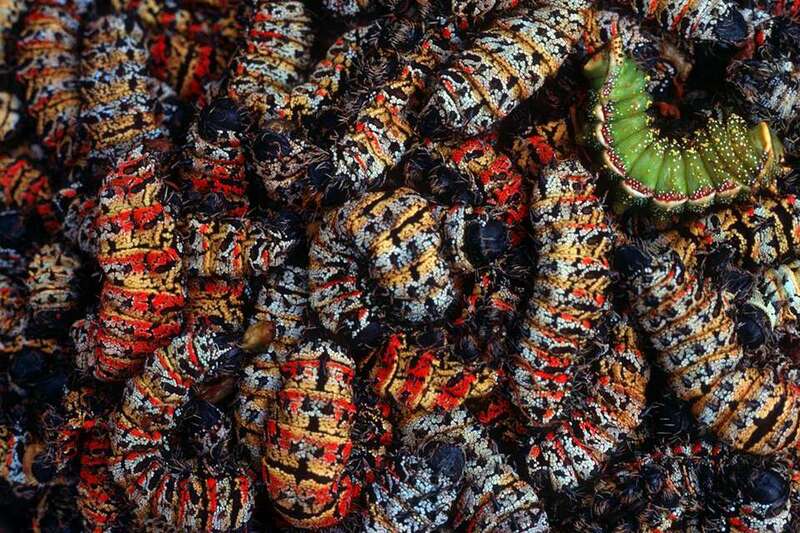 The sustainability of mopane worm businesses is often compromised by over-harvesting. Other threats to the industry include the use of pesticides to prevent the caterpillars from competing with livestock that feed on the same trees; and deforestation. Some mopane worm businesses have considered domesticating the worms in order to make the industry more reliable. A common way to eat mopane worms is in the same way that I did - fried with a combination of tomatoes, garlic, peanuts, chillies and onions. Those with access to the caterpillars can find recipes for cooking them online. Mopane worms can also be added to a stew, boiled to soften them up, or simply eaten raw and fresh off a tree. When they're fresh, they're less chewy and their flavor is undiluted by other ingredients. Whether that's a good thing or a bad thing is up to you! This article was updated by Jessica Macdonald on March 29th 2017. What Is the South African Delicacy Known as Biltong?